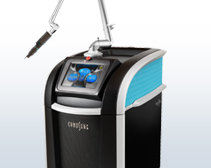 The Cynosure PicoSure Laser System offers a new level of innovation in laser technology. As the first picosecond laser designed for multiple aesthetic applications, the PicoSure is the only aesthetic laser that can magnify pressure up to 70% and widths up to 550pps. The PicoSure utilizes super short pulses that go beyond typical photo thermal treatments to create even more intense results in fewer visits. The highly effective laser system combines powerful Picosecond technology with a unique Focus Lens Array for the most effective skin revitalization results. A remarkable tool for use in wrinkle reduction, removal of tough acne scars, tattoo removal and other aesthetic skin applications, the PicoSure offers a variety of powerful treatment options all in one easy to use laser system. It’s the perfect multi-functional tool for any cosmetic practice. The PicoSure’s powerful laser can break up even the most stubborn lesions, tattoos and other marks, while minimizing damage to surrounding skin. The innovative laser design ensures that marks are completely removed painlessly and without scarring. The system is safe for use on all skin types and offers remarkable results in a variety of patients. When you are looking for a flexible, comprehensive laser skin treatment option for your practice, look no further than the Cynosure PicoSure Laser System. The PicoSure makes it easy to add a variety of in-demand services to your practice so that you can focus on growing your patient base. The system is easy to operate and maintain, and it delivers optimum treatment results every time. SunrayLaser.com has amazing deals on used Cynosure PicoSure laser equipment with savings that are up to 60% off the original price! See for yourself how much you can save on high quality used laser equipment when you buy from SunrayLaser.com. If you are looking for pricing information on a pre-owned Cynosure PicoSure laser system, fill out the contact form below and we’ll send you a free, no obligation quote.